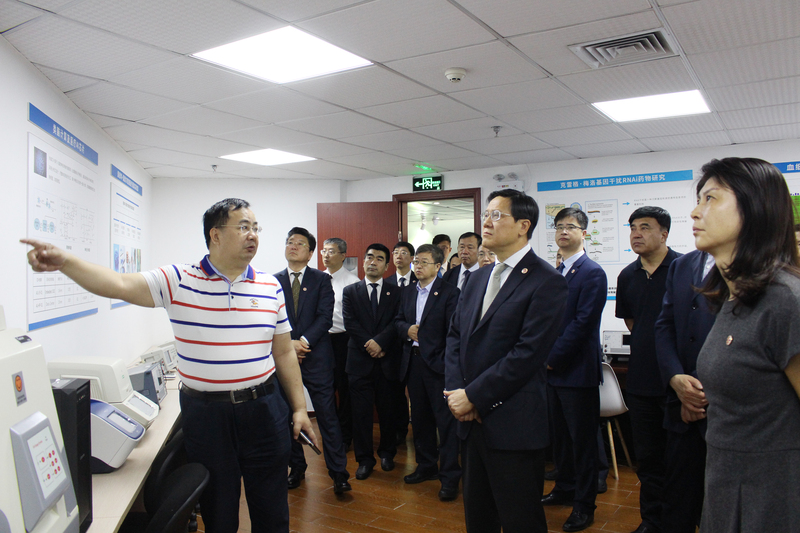 Gem Flower Group inspects E-Techco (Qianhai AnyCheck) "AI Medical Cloud"
On April 11th, 2019, Mr. Wang Shihong, Chairman of Gem Flower Healthcare Investment Holding Group Co., Ltd., Ms. Wang Xiaobin, Executive Vice Chairman, and other senior management team of Gem Flower Healthcare, nearly 30 people in Huawei Cloud Medical Director Mr. Zhang Shaowei, Huawei (PetroChina) Accompanied by the introduction of Mr. Dai Qijia, the Director of the Client, he visited the Shenzhen Branch of E-Techco Group (Qianhai AnyCheck) to inspect the technological innovation and industrialization of “AI+Health Cloud+Pillage Cloud+Medical Cloud”. 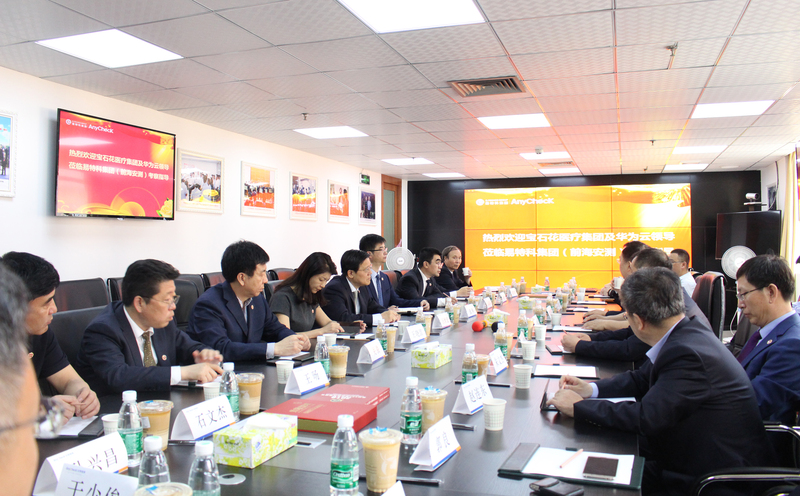 Mr. Zhang Guanjing, Chairman and CEO of E-Techco Group, and Ms. Xiao Yingfen, Vice Chairman of the Board of Directors, accompanied the whole team to accompany them. 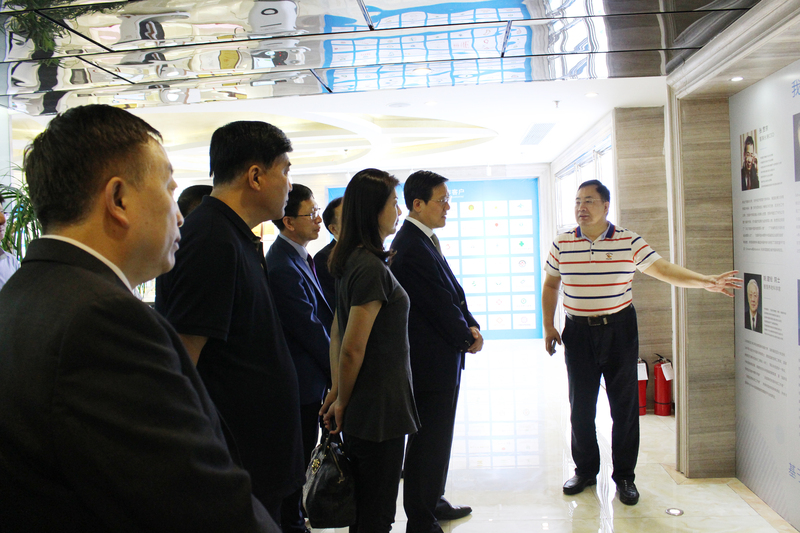 Accompanied by Chairman Zhang Guanjing, Gem Flower Healthcare Group visited the smart medical laboratory, research and development center, product exhibition hall and cultural exhibition hall. 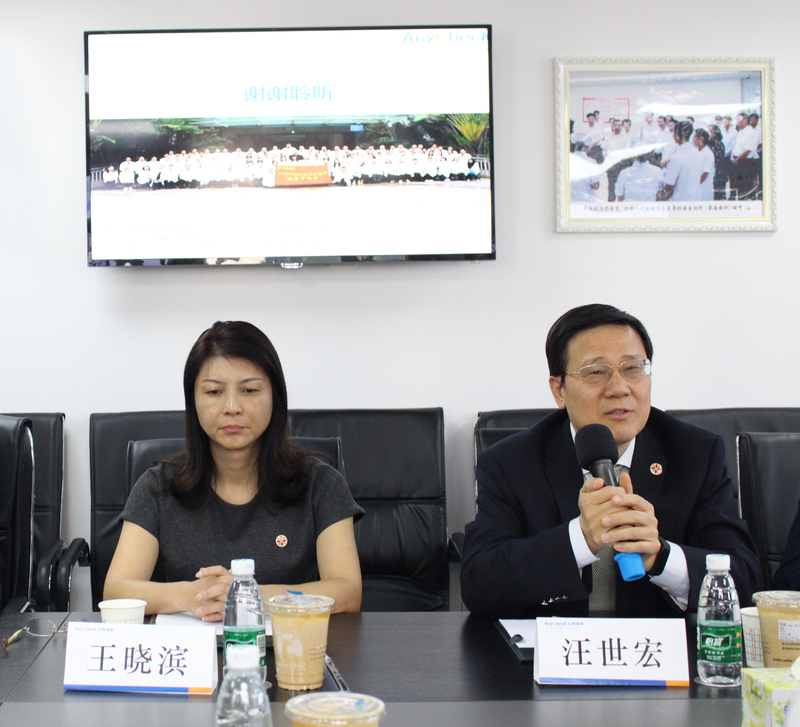 In the Smart Medical Laboratory, Chairman Zhang Guanjing introduced to the Gem Flower Group delegation the wisdom medical Nobel Prize laboratory project that our company cooperated with the Nobel Prize-winning scientists Professor Edvard I. Moser and Professor Craig C. Mello, and the group assisted by Chinese medicine AI. Diagnose big data platform, AI medical cloud platform, AI physical examination & chronic disease screening big data platform, AI tumor screening and auxiliary diagnosis big data platform research and development innovation, the delegation listened to the report and praised E-Techco (Qianhai AnyCheck) The technical application of “AI+Medical+Health+Support” has outstanding innovative ideas and development prospects. 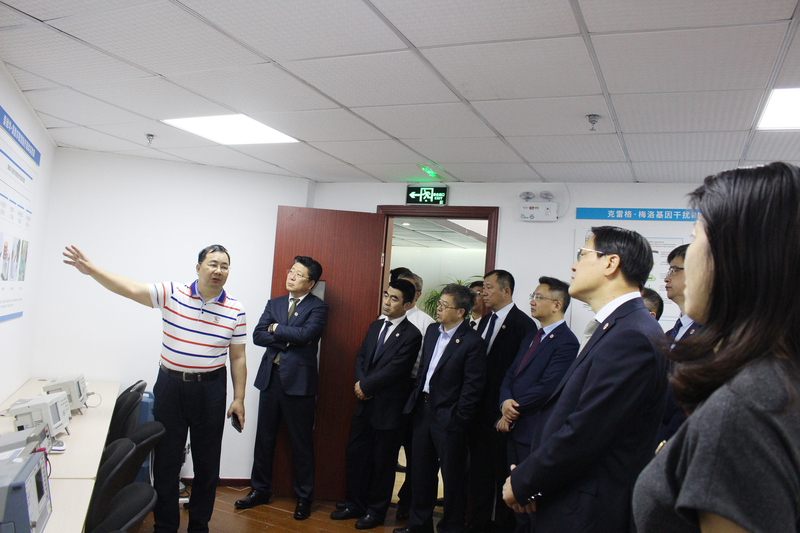 In the R&D center, the delegation focused on inspecting the scientific research transformation of more than 3,000 patent technologies of the group, focusing on the key patent technology innovations such as the China Patent Excellence Award, and the delegation praised the continuous development of the patent business of E-Techco Group, patent management and The service system scores are gratifying. 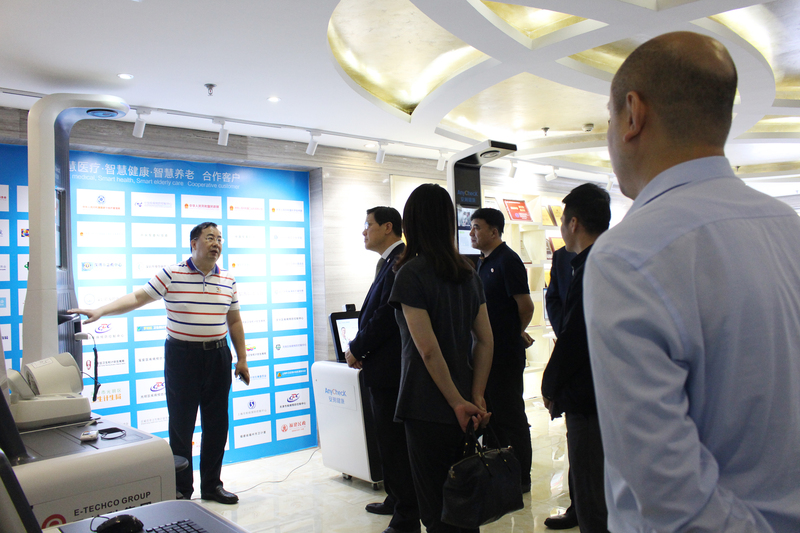 In the product exhibition hall, our research and development team demonstrated the products and services of Anzhen Health Integrated Intelligent Machine, Chinese Medicine Four Diagnosis Apparatus, Physical Fitness Analyzer, Treatment of Untreated Disease System, and Slow Disease Management System to the delegation. Zhang Guanjing introduced the chairman. Our self-service health monitoring intelligent integrated machine and safety test AI+ chronic disease management platform were selected into the “Smart Health Pension Products and Services Promotion Catalogue” jointly recommended by the Ministry of Industry and Information Technology, the Ministry of Civil Affairs and the National Health Care Committee, and the development and industrialization of chronic disease management systems. The project won the second prize of Shenzhen Science and Technology Progress Award. 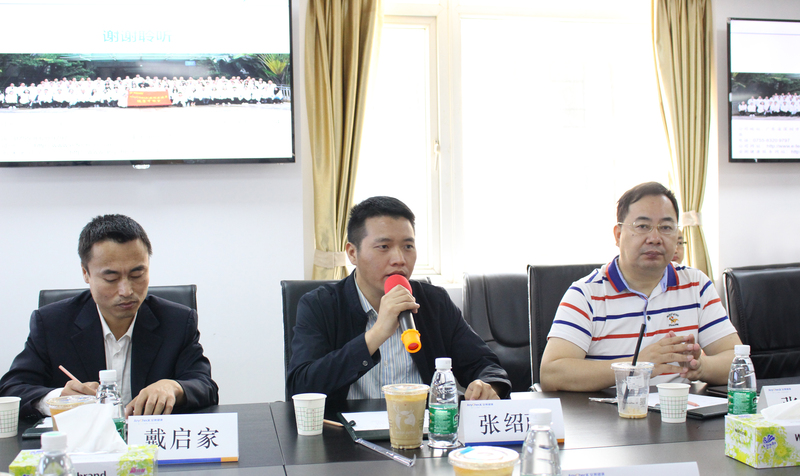 The delegation also conducted a detailed and in-depth study of the Group's product market applications, research teams, industry-university-research cooperation, and honors. 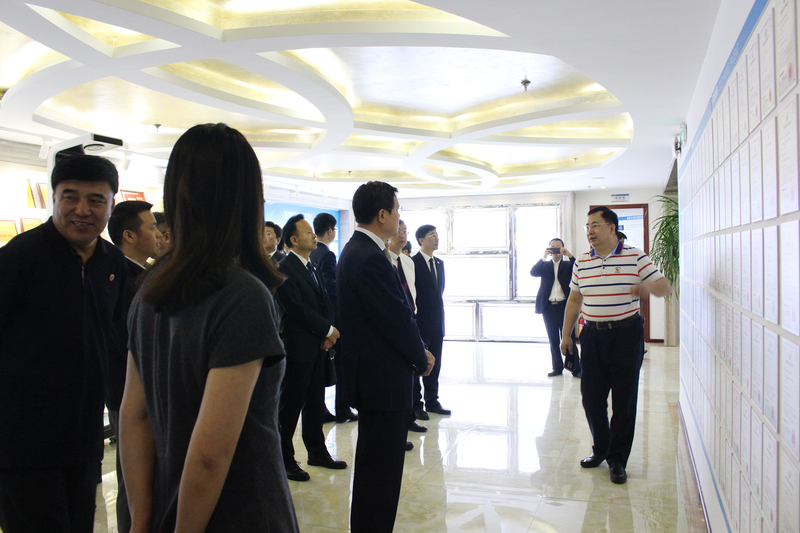 At the symposium, Mr. Zhang Guanjing, Chairman and CEO of E-Techco Group, first expressed his heartfelt gratitude to the Gem Flower Team and the Huawei Cloud team for their inspection and cooperation and support, and introduced the development of the Group to the participants, focusing on the Group's recent development. The innovations achieved. Chairman Zhang Guanjing said that innovation is the core competitiveness of E-Techco (Qianhai AnyCheck), and has fully integrated strategic cooperation with Huawei Cloud, introducing Huawei Cloud's AI R&D platform (GPU and ModelArts)/algorithm computing power and knowledge mapping tools. The R&D team of our company is focusing on improving the technology research and development of AI medical cloud, AI chronic disease cloud, AI Chinese medicine cloud and AI tumor cloud, and further deepening the research and development innovation of high-end intelligent image diagnosis systems such as AI-TCM, AI-CAD and AI-MRI. Industrialization. We are making a company that is at the forefront of the times and a leader in the industry through technology research and development, industry-university-research cooperation, etc., and become the leader in the smart medical industry. Our company is providing AI medical information services to medical institutions across the country through Huawei's platform. As a solution provider, marketing partner, customer, supplier, R&D partner and Huawei Cloud AI Club member of Huawei Cloud, the cooperation between E-Techco Group (Qianhai AnyCheck) and Huawei Cloud is deepening and is also being Huawei. Together with the cloud, we are dedicated to providing professional services to more medical institutions. Chairman Zhang Guanjing also said that E-Techco Group, together with Huawei Cloud, is willing to contribute to the growth of the Gem Flower Group as a world-class medical group and a world-class medical care group, in order to improve the efficiency and effectiveness of clinical medicine and health services. Provide technical support for efficiency. 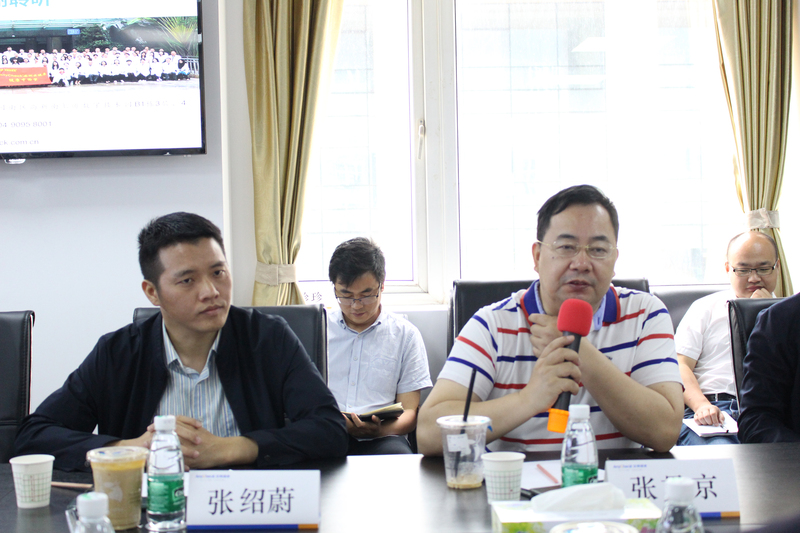 In his speech, Mr. Wang Shihong, Chairman of Gem Flower Healthcare Investment Holding Group Co., Ltd. affirmed the pioneering role of E-Techco Group in technological innovation and patent innovation. He also expressed the innovative spirit of E-Techco Group and the integration of global advanced medical care with Gem Flower Healthcare. The resources and the development concept of China's future medical reform coincide, and both sides have extensive cooperation foundations and space. I hope that the two sides will strengthen exchanges of experience in talents and technologies in the future, and deepen mutual understanding and deepen mutual friendship! Chairman Wang Shihong also said that Gemstone Group strives to become a world-class medical group and a world-class medical care group. 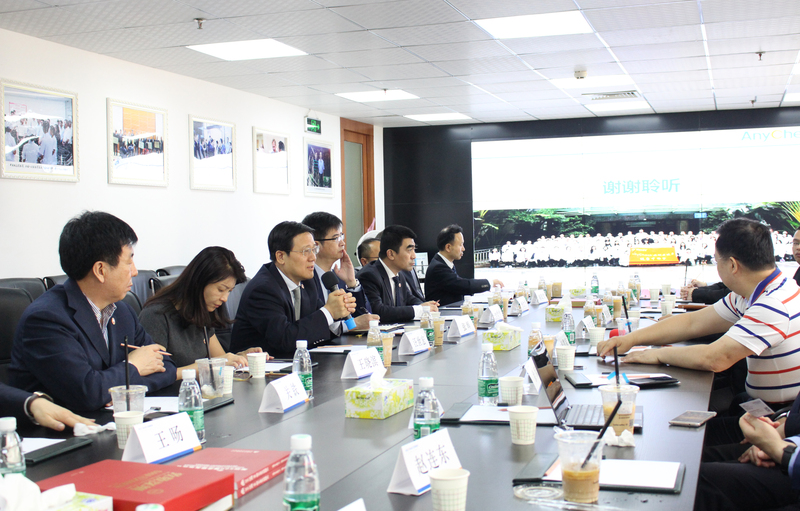 It hopes to cooperate with high-tech companies such as Huawei and E-Techco Group to enhance clinical medical services and health through technological innovation. The ability and level of management. 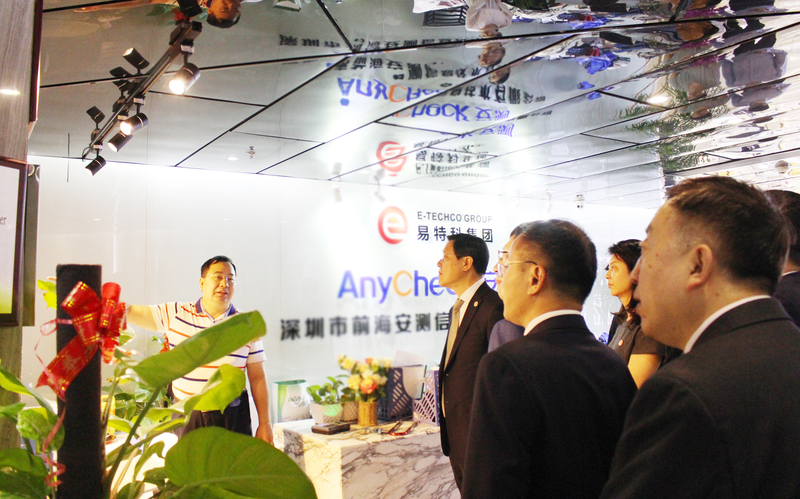 Chairman Wang Shihong and Vice Chairman Wang Xiaobin also expressed support for the cooperation with E-Techco Group (Qianhai AnyCheck) strategic level! Mr. Zhang Shaowei, Director of Huawei Cloud Medical, mentioned that E-Techco Group (Qianhai AnyCheck) and Huawei Cloud have in-depth strategic cooperation and are one of the members of Huawei Cloud 10 AI Club. 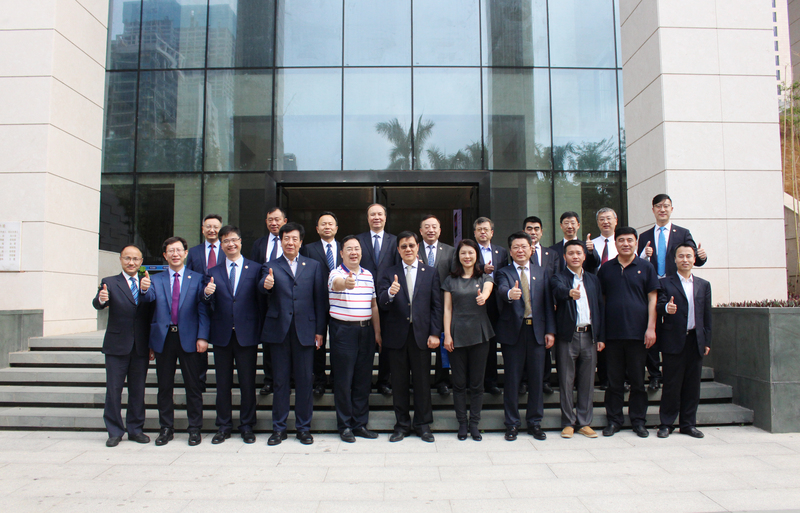 They hope Huawei Cloud, E-Techco Group, Gems Hua Medical Health Group will strengthen communication and communication in the fields of digital medical health and artificial intelligence in the future, and promote cooperation with strategic, forward-looking and systematic thinking to promote the development of smart medical innovation and better serve the people's health! Mr. Zhang Shaowei, Director of Huawei Cloud Medical, also said that Huawei Cloud will be customer-centric and work together with partners (E-Techco Group) to provide high-level professional services to customers such as Gem Flower Group. 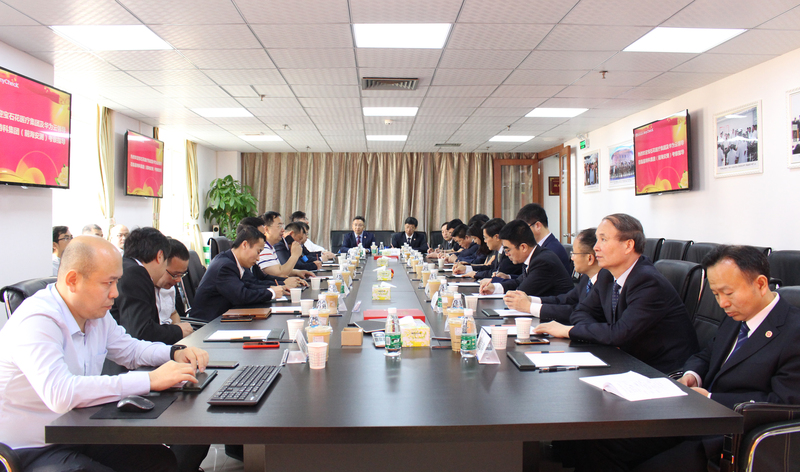 Through on-the-spot viewing, listening to reports and seminars, Gem Flower Healthcare Group delegation gave high praise to our company's scientific and technological innovation, smart medical projects, patent technology, product innovation, and township. The first meeting between the two sides was a complete success. It will lay a solid foundation for future cooperation between the two sides. E-Techco Chairman and CEO Zhang Guanjing, Vice Chairman and MD Xiao Yingfen, CTO Ge Xinke, Senior Vice President Wang Hairong, Chief Engineer Gao Weiming, Vice President Tang Xiaolang, Vice President Song Ruodong, Chief Engineer Zhang Hongzhi, Deputy Chief Engineer Zhou Liang, Investment Manager Huo Jianxin, pre-sales manager Zhao Kangfu, president assistant Chen Xiu, president assistant Yang Yanming, propaganda department director Ding Liang, propaganda department senior engineer Yi Yong, propaganda department manager Zhang Yeyu and other E-Techco Group team; Gem Flower Healthcare Investment Holdings Chairman of the Group Co., Ltd. Wang Shihong, Executive Vice Chairman Wang Xiaobin, Vice President Zhang Hui, Vice President Guan Tie, General Manager of Gem Flower Medical Assets Investment Co., Ltd. Ma Deku, General Manager of Gem Flower (Liaoning) Medical Health Management Co., Ltd. Shi Wenjie, General Manager of Jilin Gem Flower Jiji Medical Health Management Co., Ltd., Yang Shiping, Executive Deputy General Manager of Sichuan Gem Flower Medical Management Co., Ltd., Sun Xingchang, General Manager of Lanzhou Gem Flower Medical Management Co., Ltd., Gem Flower Changqing Medical Health Investment Management Co., Ltd. Manager Xi Jiantang, Liaoyang Gem Flower Medical Management Co., Ltd. Manager Zhu Wenjie, General Manager of Gem Flower Oriental Medical Health Management Co., Ltd. Qi Zhitao, General Manager of Xinjiang Gem Flower Healthcare Management Co., Ltd. Yu Shaojun, General Manager of Huludao Gem Flower Healthcare Management Co., Ltd. Zhao Liandong, Gem Flower Healthcare Investment Holding Group Limited Chen Hongli, deputy director of information of the company's innovation and information technology department, Yang Yidong, deputy general manager of Gemshua Medical Information Technology Co., Ltd., Guo Liang, sales manager of Gemshua Medical Information Technology Co., Ltd., Gem Flower Xu Jun and other gemstone medical group; Huawei Cloud Zhang Shaowei, medical director, Dai Qijia, customer director of Huawei's major customers, and Huawei's Kong Zhenzhen, attended the meeting. 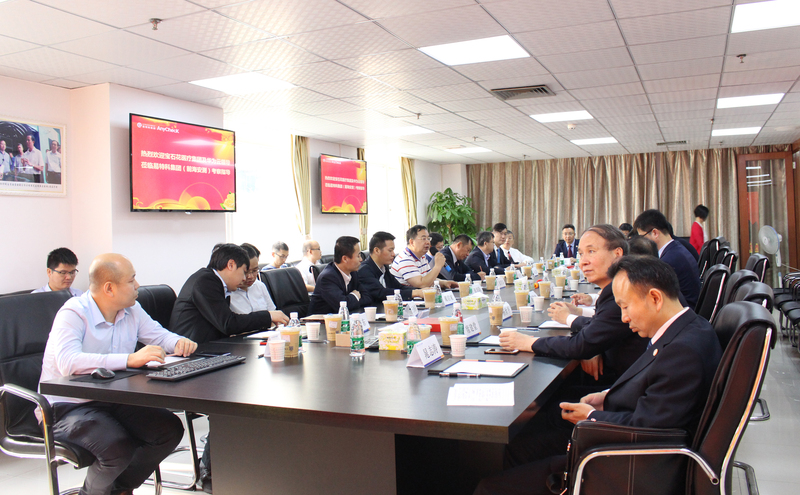 Gem Flower Healthcare has formed about 10 tertiary hospitals and more than 300 medical institutions through the integration of relevant medical assets of CNPC. The operating income is about 10 billion yuan, the number of beds is about 20,000, and the families of more than 4 million oil workers are served. China and the largest medical and health industry group in Asia with tens of millions of residents. Gem Flower Medical intends to integrate the world's advanced medical resources through the eight platforms and three-level development ideas to help China's future medical reform and development.